As the exhibition begins at IBC, we bring you the expected highlights and key product launches to watch out for. With over 50,000 people descending on the RAI in Amsterdam as the exhibition begins at IBC, we highlight some of the key product launches for the pro-audio professional in attendance. Calrec will use IBC 2015 to showcase the first technology release developed in conjunction with DiGiCo since the formation of the Audiotonix pro-audio group in August 2014. DiGiCo consoles can now integrate onto the Hydra2 network via a Hydra2-enabled DiGiCo Multichannel Interface (DMI) card. DiGiCo’s range of cards converts audio from one transport protocol to another and can be placed in DiGiCo’s “anything in, anything out” Orange Box, or directly into the back of the company’s newest digital mixing console, the S21. 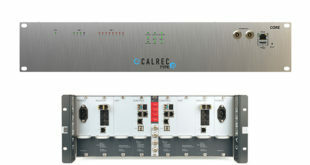 Calrec will also debut two compact aluminium expansion units, its new Fieldbox I/O range and H2Hub switch point, which can be used to expand and distribute a Hydra2 network. Bel-Digital will be unveiling the first Dante audio monitor. The BM-A1-64DANTE, which provides audible monitoring as well as visual signal strength indication, is designed to provide a simple and effective way of monitoring the audio present in Dante networks. It provides a visual indication of signal strength on all 64 selected Dante channels. 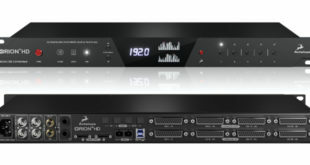 Each individual channel can also be audibly monitored, or the operator can combine up to 16 channels to provide a unique stereo monitor mix. Housed in a rugged, compact 1U rack chassis, the BM-A1-64DANTE features a redundant power supply as standard and offers full audio redundancy over a Gigabit Ethernet network. Visitors to IBC will also get the chance to explore four ‘audio worlds’ on the joint Sennheiser and Neumann stand in Hall 8 (#D50). ENG (Electronic News Gathering) World is where Sennheiser will preview a brand new wireless product, while there will also be a typical radio station environment, TV broadcast studio and dedicated sports broadcasting set-up to check out – four showcases that together provide a complete overview of the two audio companies’ broadcast offering. Dan Dugan Sound Design will demonstrate three new products for management of live microphones in unscripted talking situations – the Dugan Model M and Model N automatic mix mixers, as well as the Model K tactile control panel. NUGEN Audio will be showing its Halo Upmix tool at IBC 2015. Halo Upmix is designed for creating a stereo-to-5.1/7.1 downmix-compatible upmix with optional dialogue isolation in the centre channel. It will be available in Avid AAX, VST and AU formats. “We’re relentless in making sure that we cover the full gamut of loudness standards, and at IBC we’ll show why NUGEN Audio continues to be the go-to provider of loudness software solutions. In addition, our new Halo Upmix tool will be a radical new approach to upmixing that not only provides the downmix compatibility for TV surround production, but also provides enough creative malleability for film audio professionals. It’s another example of how we use our innovative approach to solve a wide range of audio issues faced by TV and film post-production professionals,” said Jon Schorah, founder and creative director at NUGEN Audio. Taking pride of place on the CEDAR Audio stand is the company’s DNS 8 Live dialogue noise suppressor. Designed for live broadcast and live sound, it offers eight channels of noise suppression, and is quick and simple to use, especially when coupled with CEDAR’s browser-based remote control system. The d:facto Interview Microphone will take centre stage on the DPA stand. It features an omnidirectional 2006V capsule, based on DPA’s original 2006, but with sensitivity adjusted down 12dB to accommodate typical interview mic and wireless handle sensitivities. The manufacturer, in conjunction with its Dutch distributor Amptec, will also be running a daily competition to win a microphone. Visit the DPA stand to find out more. Yamaha’s flagship mixing console, RIVAGE PM10, will be the subject of one-to-one demonstrations by technical staff on stand 8.A69. Visitors will also be able to get their hands on Nuage version 1.7 software, featuring support for Steinberg Nuendo 7. 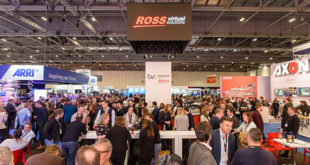 Riedel is set to showcase the latest addition to the MediorNet line of real-time signal networks. MicroN, an 80G media distribution network device, is a high-density signal interface with a complete array of audio, video and data inputs and outputs, including 24 SD/HD/3G-SDI I/Os, two MADI optical digital audio ports, a Gigabit Ethernet port, two sync reference I/Os, and eight 10G SFP+ high-speed ports. It offers routing and processing capabilities that can be tailored for productions of all sizes and complexity. A single unit serves as a stand-alone point-to-point router and processor, while multiple interconnected units support scalable decentralised video routing. Roland’s OHRCA M-5000C digital mixing console will make its European debut at IBC. Measuring under 30in in width and weighing 70 pounds, the compact M-5000C offers all the flexibility and power of the M-5000 console but in a smaller footprint – making it suitable for touring, broadcast, theatre and live performance. It also uses the same OHRCA platform as the M-5000 and offers a 96kHz sampling rate, 72-bit summing bus, newly designed, discrete analogue circuitry and redundant power supply.